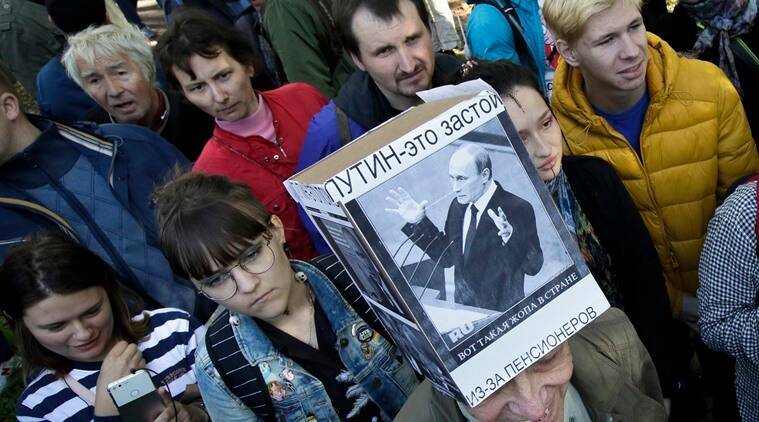 Around 500 people demonstrated in St Petersburg on Sunday against planned increases in Russia’s pension age, a week after hundreds were detained for protesting against the reform that has hurt President Vladimir Putin’s approval rating. Sunday’s protest in Russia’s second city was smaller than rallies a week ago in 80 towns and cities that were organised by jailed opposition leader Alexei Navalny. More than 800 people were detained during those demonstrations, the bulk of them in Saint Petersburg after the authorities there initially authorised a rally before reversing their decision. OVD-Info, a human rights organisation that monitors detentions, said that three people had been detained during the rally.